August 31, 1918: Municipal Journal article. Selection of Material for Service Pipes. “Service connections generally give more trouble to the superintendent than any other part of the water works system. This trouble is of two kinds, one being the deterioration of the quality of the water, the other consisting of leaks and stoppages. To minimize these troubles, the selection and laying of service pipes and the appurtenances combined with them should receive the most careful consideration of the superintendent…. About a year ago a committee of the New England Water Works Association collected some statistics about service pipe, mostly from New England States. These showed that 22 cities had abandoned the use of uncoated iron or steel pipe, 11 of them adopting galvanized, 4 adopting lead, 3 lead-lined, and 4 cement-lined. Seventeen had changed from galvanized to other kinds, 7 of these to lead, 7 to lead-lined, 2 to cement-lined, and 1 to enameled. Six had abandoned lead pipe, 4 of them for galvanized and 2 for cement-lined. Eight had abandoned lead-lined pipe, 5 for galvanized, 2 for cement-lined and 1 for uncoated iron or steel. Twenty-seven had abandoned cement-lined, 16 for galvanized, 6 for lead and 5 for lead-lined. The changes from plain ungalvanized pipes were made almost entirely on account of rust. Changes from lead pipes were largely on account of the possibility of lead poisoning, although in some cases it was on account of expense or because the pipes did not have sufficient strength. Lead-lined pipe was abandoned on account of lead poisoning and trouble from bursting and because of the difficulty of making joints that will not corrode. Commentary: From this article and the one published yesterday (August 30), it is clear that water system managers and operators knew the dangers of lead pipe in the 19th and early 20th century. The fact that it was still widely used in some cities into the 1980s and 1990s is astonishing on many levels. Of course, Washington, DC remains the poster child for how not to deal with a lead service line problem. This entry was posted in Year 2 This Day in Water History and tagged drinking water, lead service lines, public health, water, water history on August 31, 2014 by safedrinkingwaterdotcom. August 30, 1895: Birth of Alvin P. Black. “Born in Blossom, Texas, in 1895, Alvin earned a B.S. Degree at Southwestern University, completed graduate studies at Iowa State College and Harvard, and received his Doctorate Degree from the University of Iowa. During World War I, he served in the Chemical Warfare Service; following that, he joined the faculty of the University of Florida in 1920 as Assistant Professor of Chemistry. During his tenure there, Dr. Black earned national and international recognition in the field of water chemistry. He served as a consultant to numerous municipalities throughout the country since 1935. 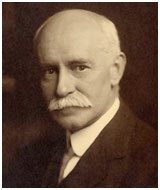 Dr. Black joined the American Water Works Association in 1929 and served as both National Director and President. He also served as a member of the National Advisory Dental Research Council of the U.S. Public Health Service, and was appointed by the Surgeon General of the United States as one of the original members of the Advisory Committee on Coagulant Aids in water treatment. Dr. Black also served as a national consultant to the Office of Saline Water of the Department of the Interior. He is considered, today, a pioneer in the design of water treatment systems. This entry was posted in Year 2 This Day in Water History and tagged A.P. Black, AWWA, CH2M Hill, drinking water, lead poisoning, public health, water, water history on August 30, 2014 by safedrinkingwaterdotcom. August 29, 1924: A complete filtration plant is finally built in Richmond, Virginia. Albert Stein built the first effort to filter a drinking water supply in the U.S. in Richmond in 1832. However the filtration plant was not successful and it was abandoned in 1835. Other efforts were made over the years to treat the Richmond water supply. Reference: Baker, Moses N. 1981. The Quest for Pure Water: the History of Water Purification from the Earliest Records to the Twentieth Century. 2nd Edition. Vol. 1. Denver, Co.: American Water Works Association, 130-1. This entry was posted in Year 2 This Day in Water History and tagged Albert Stein, drinking water, filtration, public health, Richmond, Virginia, water, water history on August 29, 2014 by safedrinkingwaterdotcom. August 28, 1869: Birth of Allen Hazen. “Allen Hazen (1869–1930) was an expert in hydraulics, flood control, water purification and sewage treatment. His career extended from 1888 to 1930 and he is, perhaps, best known for his contributions to hydraulics with the Hazen-Williams equation. Hazen published some of the seminal works on sedimentation and filtration. He was President of the New England Water Works Association and Vice President of the American Society of Civil Engineers. The simple rural life in Andes, New York was shattered by the Civil War in 1862 when the 144th Regiment, New York Volunteers was formed in Delaware County and the surrounding area. John R. Leal’s first appointment was as regimental surgeon and over the next three years he was promoted to surgeon at the brigade, division and corps levels. Toward the end of the war he held the title of Medical Director in the Department of the South. According to an obituary, Dr. Leal was wounded twice and was with his regiment at the battle of John’s Island. The 144th Regiment was stationed on Folly Island in 1863 as part of the siege of Charleston, South Carolina. According to the history of the regiment, “very nearly every man in the Regiment got sick…with bad and unhealthy water to drink.” The only treatment at the time for the debilitating dysentery that overwhelmed the Regiment was the administration of “opium pills” by Dr. Leal. The pills did not cure anything but they made the recipients feel somewhat better. Dr. Leal became so ill that he received medical leave for a time, but it is clear from the records that he never fully recovered. Dr. Leal was mustered out of the 144th Regiment on June 25, 1865 after which time he returned to his simpler life in Andes, New York. However, he brought a dreadful souvenir of the war home with him and he suffered with it for the next 17 years. This entry was posted in Year 2 This Day in Water History and tagged Allen Hazen, drinking water, filtration, Hazen-Williams coefficient, hydraulics, John L. Leal, John Rose Leal, public health, The Chlorine Revolution, water, water history on August 28, 2014 by safedrinkingwaterdotcom. This entry was posted in Year 2 This Day in Water History and tagged drinking water, Providence, public health, Rhode Island, water, water history, water supply, William P. Mason on August 27, 2014 by safedrinkingwaterdotcom. 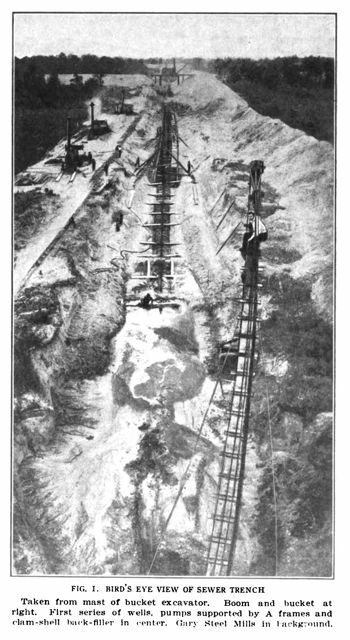 August 26, 1908: Municipal Journal and Engineer article. Wet Excavation of a Sewer Trench. “At Gary, Ind., where two years ago was prairie is today a city of 15,000, with ten miles of paved streets, twenty miles of gas mains, electric light plant, telegraph and telephone service. To complete the list of public services a sewerage system is now nearing completion, which will contain about twenty miles of mains and cost about $350,000. Several details of this system contain novel features, but one of the most interesting is the method employed by the contractors, Green & Sons, of Chicago, in trenching through a swamp underlaid with so-called quicksand. This trench was approximately 30 feet deep, 22 feet below the level of the ground water. The material excavated is said to be so saturated that an excavation in it one foot deep will take a width of thirty feet. The ground is in several places very low and contains ponds three or four feet deep. These conditions made ordinary methods impossible. Commentary: It appears that Gary, Indiana sprang out of the ground as an industrial center complete with a city infrastructure. The most interesting thing about this article is the amazing photograph. As noted on the photo it was taken from the mast of a bucket excavator, presumably with a photographer in the bucket towering 30-40 feet about the ground. This entry was posted in Year 2 This Day in Water History and tagged sewage, sewer construction, water, water history on August 26, 2014 by safedrinkingwaterdotcom. Commentary: Dr. Crumbine is the same fellow who championed the banning of the common cup in Kansas and was instrumental in getting it banned on interstate carriers by federal regulation. 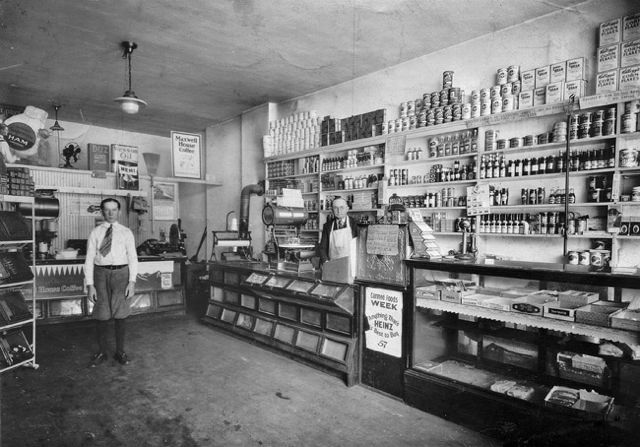 This entry was posted in Year 2 This Day in Water History and tagged Dr. Crumbine, drinking water, Kansas, public health, typhoid fever, water, water history on August 25, 2014 by safedrinkingwaterdotcom.